Leaflet with this flyer between now and Tax Day, Tuesday, April 15, 2008. There are peace groups around the country — get out and be visible against the war! Write the President and Congress and demand that war money be used for services instead. Write letters to the editor of your local paper. Send them all copies of this flyer. Write letters to the editor of your local paper. Send all of them copies of this flyer. Protest with your money! Sign up at wartaxboycott.org. Refuse to pay all or part of your income tax. Whatever you choose to refuse — $1, $10, the 7% that pays for wars in Iraq and Afghanistan, or more — send a letter to elected officials and tell them why. Though illegal, thousands of people openly participate in this form of protest. You can take control of your paycheck and avoid contributing to the military. Contact us for information or referral to a counselor near you. Contribute resisted tax money to organizations working to help people, provide needed services, or care for victims of war. For more about refusing to pay for war, contact the National War Tax Resistance Coordinating Committee, PO Box 150553, Brooklyn, NY 11215, (800) 269-7464; www.nwtrcc.org. Support the Peace Tax Fund bill to allow 100% of your taxes to fund nonmilitary programs: (888) 732-2382; www.peacetaxfund.org. Support military personnel who refuse to fight in Iraq and Afghanistan. For more information see www.ivaw.org or www.girights.org. Call the GI Rights Hotline if you are in the military and need help: 800-394-9544. 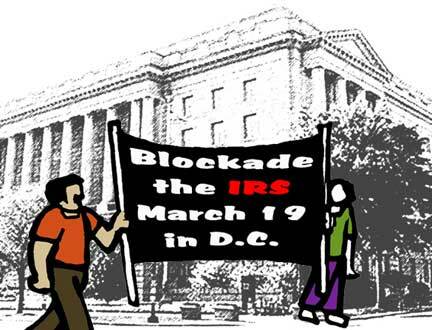 Join the 2008 War Tax Boycott!